Alila Villas Uluwatu - bringing elegance and flair to romantic unions. Our weddings are set in a tropical landscape, amidst sprawling lawns above the azure waters of the vast Indian Ocean - a fitting backdrop for couples looking for a truly fresh and inspiring island setting for their marriage. Let us arrange the perfect intimate wedding, customized specifically to mark the start of your lives together. Besides our intimate wedding villas in Bali, several spectacular event venues are available within the resort, including our signature Cliff-edge Sunset Cabana, an overhanging cliff-side platform with a dramatic view over the Indian Ocean. 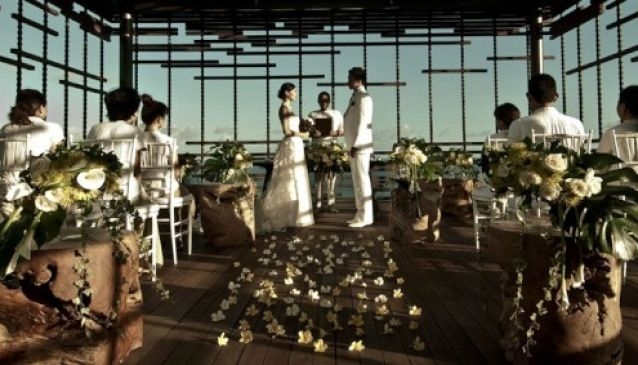 Wedding ceremony up to 30 guests at the three bedroom pool villa cabana from 1700 - 1900. Standard sound system with CD player and two microphones - Electricity 3000 watt. Personalised event menus, according to your preferences. Let our chef craft a unique dining experience for you and your guests. Just tied the knot? Rekindling your romance? Celebrate your life together with shared moments of bliss. Visit the sanctuary of SPA ALILA and treat yourselves to an extensive choice of pampering Balinese rituals. Share a love for adventure and the great outdoors? Explore the wonders of the Uluwatu and Bukit region on one of our 'Journeys by Alila' and build a new chapter of memories together! Alila Villas Uluwatu offers a private dining experience 70-metres above the crashing waves. Savour the feast of delicacies in the elegant setting of CIRE private dining room. For exclusive romantic space, choose to dine at the cliff edge CABANA or in the privacy of your villa. The Celebration Team will also be pleased to assist with special flowers, candles or music arrangement. View our luxury villas under ACCOMMODATION - HOTELS.